Let me first preface this review with this: it took me forever to read this book. It was really no fault of the book itself. Somehow this became my bed stand book that I only picked up in the few minutes that the hubster and I were getting ready for bed. Because of this, I don’t think it’s fair for me to say the book was “slow” or “uninteresting” or even “confusing” because any book that you only read 4 or 5 pages at a time with isn’t going to have time to catch your interest. That being said, the first adjectives that come to mind when I think about this book is slow, uninteresting, and confusing. Maybe I’m just not fair. But I love Atwood. She wow’d me with The Handmaid’s Tale but I truly fell in love with The Blind Assassin. The woman is a genius and even with my sludge-y read, by the end of this book I felt awed. She’s got this post-apocalyptic thing down. What starts off as something bizarre and strange pulls together into something that makes sense (in a horrifying, I wish-I-didn’t-understand-as-well-as-I-did kind of way). Still, even with that, the wrap-up of the book just wasn’t what I wanted to would find. I always do my best to keep out spoilers, so let’s just say I had hoped to get more from the characters we were promised we would meet. I wanted some good interaction but it wasn’t there. I also have a huge qualm with trilogies that are trilogies just to be trilogies. I feel like the three books should stand alone. When you get the end you’ll realize that this doesn’t stand alone in the least. It could be the most heart-stopping cliff-hanger ending ever. Yes, even more than the season finale of season 4 of The X-Files. So, at this point, I can’t say if it’s a pick-up or a put-down. I think the rest of the trilogy will tell. 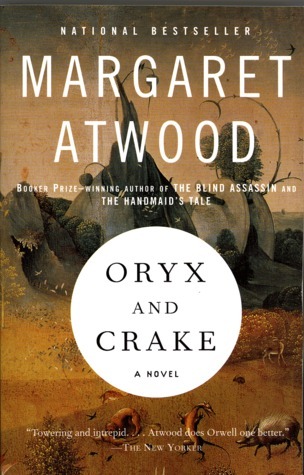 In truth, if this were by a different author I wouldn’t even go on, but I trust Atwood and I’m willing to make my way to the The Year of the Flood to see what happens.